On May 10, 2018, I attended the American Cancer Society 13th Annual Taste of Hope event in New York City. I purchased my VIP ticket at $275 which included a gift bag and early access to the food and festivities. The event had two honorees: Sarabeth Levine was this year’s culinary honoree and Chef Antonio Prontelli was this year’s survivor honoree. Below are images from the event. There were a lot more stuff at the event. The event set up gets better and better every year. There were a lot of wine tastings, beer tastings and emerging food companies promoting their products. More importantly a lot of the food tastings were on the healthier side; there were salad variations, ceviches, and barbecued dishes. I can’t wait to visit these restaurants during the upcoming restaurant week if they participate. Stay tuned. Happy Saturday and I’m counting down the days until I’m able to eat food with refined/processed sugar again. As I stated in my last post, I gave up sugar except for the natural sugars in fruits and vegetables for 40 days for Lent. It’s been really challenging and hard especially this last 10 days with the gatherings for St. Patrick’s Day. Ten days ago I’ve have had the privilege to see a preview of the food and drink at the revived Andaz Kitchen and Bar at the Andaz Wall Street Hotel in Wall Street. Previously named Dina Rata, which I learned was an Indian name meaning moon. It was deceiving that a place with that name was serving Italian food. Anyways, I preferred the new name. When I arrived, I was greeted with champagne which I did not drink due to the sugar content. However, I settled for the Chianti which has low sugar, thanks to one of the general managers who suggested the wine as he also gave up sugar. The wine went well with my selection of crudites containing fruits, and vegetables with no hummus, dressing and/or dip to avoid the possibility to ingesting sugar. I was impressed by the food display and presentation. I loved the color of the vegetables indicating that it is fresh. I also liked the cheese and cold cuts selection. Next, the passed food samples from the menu, which included a variety of dishes inspired from different cultures including Jamaica, Dominican Republic, Italy and Vietnam. It was obvious that I did not eat everything due to the 40 day sugar sacrifice. As a result I did not try anything containing bread and dessert. However, my favorite even from just looking at the menu was the Beef Peccadillo plantains. Thank you to the management team at Andaz and Andaz Kitchen and Bar including Executive Chef Pietro Consorti for making me feel welcomed. I can’t wait to return and sample the remaining dishes. Big shout out to the Liquid Lab team for a great demo on making the cocktails, which I could not participate. I do look forward to seeing them in the future. Happy Monday! With halfway through NYC restaurant week, I’m playing catch up. 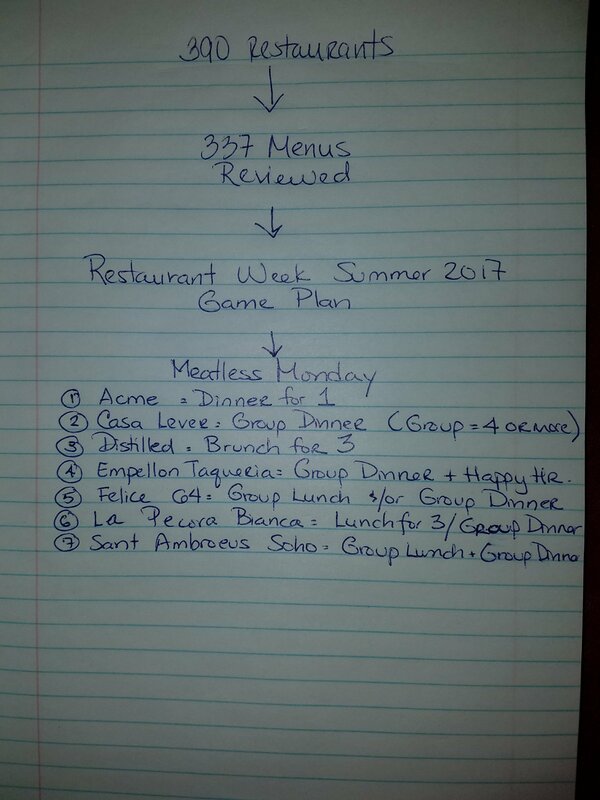 Over the last 3-4 weeks, I’ve been thoroughly reviewing 337 out of the 390 menus for this season’s restaurant week. This week I will be blogging my picks that I believe is the best bang for your buck. In addition, if you have an American Express credit card you can register your card to get an extra $5 off your meal purchase of $35 or more for up to 4x for restaurant week. If you have instagram you can take pictures of your prix fixe course and tag #NYCrestaurantweek for a daily chance of winning a $50 gift card. Since it is Meatless Monday, I came up with seven (7) participating restaurants that you can enjoy a three course vegetarian meal for either $29 or $42. Three course Prix Fixe Vegetarian Options picks for NYC Restaurant Week. Dessert: Passion Fruit Curd with Citrus, Mezcal and Meringue. 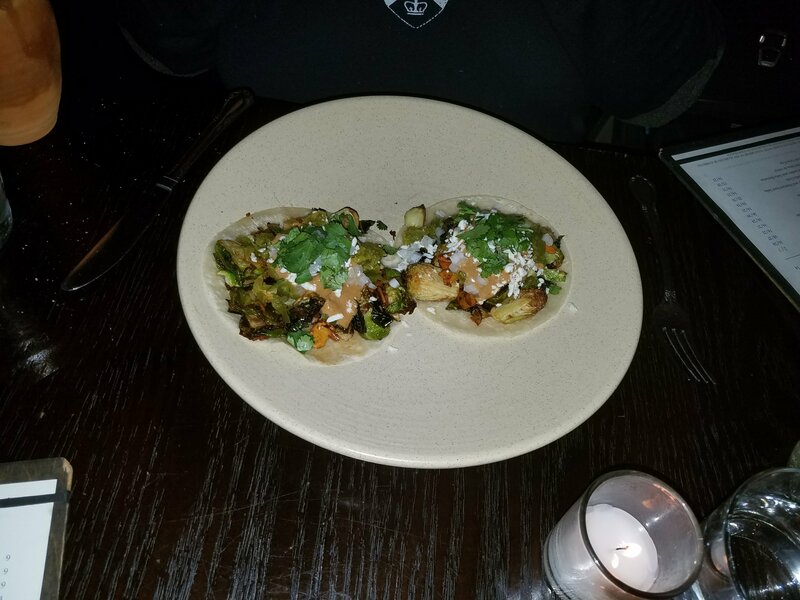 Out of the 7 restaurants, I’ve only eaten at Empellon Taqueria and their Brussels sprouts with Toasted Almond taco was so good but the portions are very small, definitely pricey for $14 for 2 tacos. Looking forward to blogging more restaurant options this week. Enjoy and stay tuned! 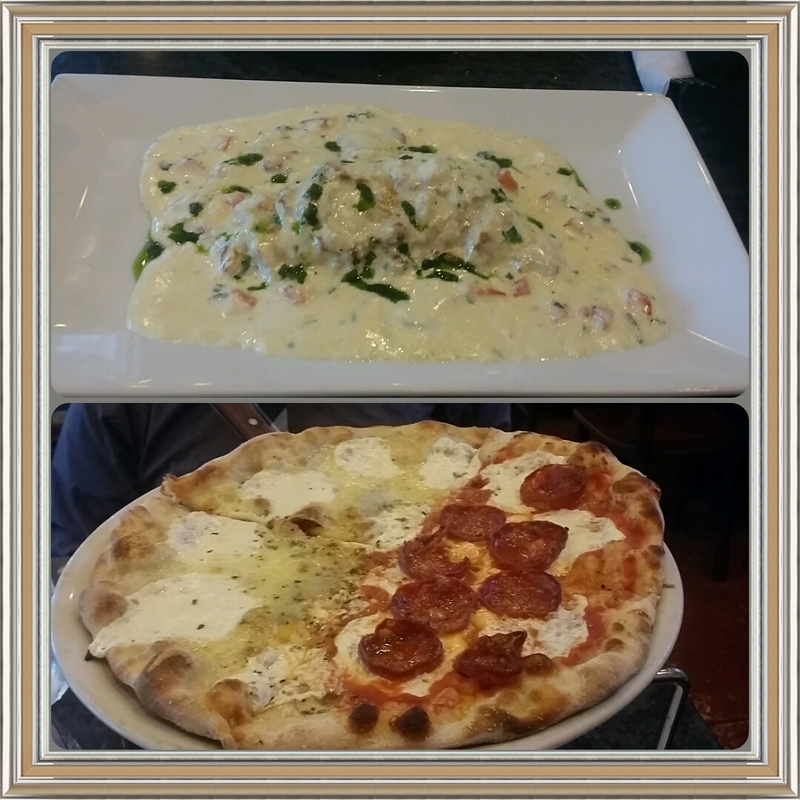 Earlier this spring I decided to try a neighborhood spot in Maspeth NY called Pizzeria Forno e Trattoria. I always pass by during my bus ride to Jackson Heights or doing my walk. The restaurant felt cozy and homey. The food looked really good and fresh. I even got overwhelmed with the options that I had to get recommendations from the manager and owner. So my guilty pleasure is cheese, I love cheese so given my cheese craving that day everything ordered had cheese in it. Therefore is what I ordered. Top photo: CREPE DI SPINACI $8.50 Crepe stuffed with ricotta and spinach topped with white four cheese sauce. Overall the dish was to die for the stuffed crepe just melts in my mouth and tasted all five kinds of cheese. It hit the spot. The pizza pie was freshly made and the pie crust was perfectly thin. I did not feel guilty consuming four different cheeses and the spicy salami. Happy Thursday!! A few weeks ago decided to finally try Himalayan cuisine. I went on a date at Himalayan Yak located in Jackson Heights, Queens. This restaurant is an eclectic mix of Chinese, Indian, Nepalese and Tibetan cuisine. Side note: this restaurant was on the scene of ABC TV series Ugly Betty. The first dish we ordered were “Momos”, which are Tibetan dumpling made of a thick dough containing meat and vegetables. There are also vegetarian momos as well. We ordered the steamed momos, one set comes with pork and vegetable ($7) and the other only had vegetables ($7.95). The food is served with julienned pickled carrots, which were spicy along with three different sauces equivalent to condiments from an Indian restaurant. These momos were good and the consistency of the dough makes it really filling. It is definitely a great starter and safe dish to try. In addition to the momos, we decided to go adventurers by entering the world of “Yak”. Yak meat is one of the healthiest and leanest meat (95%-97% lean), almost as equivalent as grass fed beef. It is also low in fat and cholesterol than beef, skinless chicken breast and even salmon. It may help with lower risk of heart disease and cholesterol. However, my date was not there yet so we compromised with yak cheese ($6.50). Given the price of the cheese we were anticipating a huge platter, but it did not appear that way. This serving plate below looks small, but the texture of each piece of cheese was insulating and filling. On a tasting level, it was equivalent to aged cheese that was overpowering, but the apple slices complimented the strong aftertaste. Yak cheese has several health benefits since it is derived from grass fed yaks in the mountains of Nepal, the cheese carries more omega-3 fatty acids especially alpha-linolenic acid (ALA), which help fight heart disease, diabetes, some cancers, and even body fat gain. Wild boar is another piece of lean meat, but it is expensive to cook. However, it has health benefits such as low calories, less fat, less saturated fat, low cholesterol, and higher protein content than beef, lamb, pork and chicken. Overall service was good, food was very good especially if one is on a budget. Personally I would return to try their other dishes especially the Thali, Ngopa, and more yak. If one wants a cheaper meal, go during lunchtime, and if you check in on Yelp.